ekiBlog.com: Giveaway: KoreaBigeyes.com giving away 5 pairs! Giveaway: KoreaBigeyes.com giving away 5 pairs! 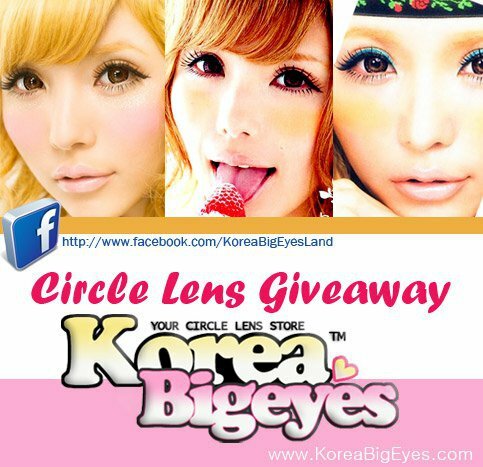 KoreaBigEyes is the leading direct to consumers marker of cosmetic circle lenses & color contact lens. We supply major Korean brand name cosmetic circle contact lenses at very competitive prices. We pride on the high quality of customer service and order fulfillment. All emails and question will be answer in less than 24 hours. We ship worldwide though EMS Express international and registered airmail services. and should arrive within 3-7 days (EMS courier) or 7-14 days (registered airmail) for overseas delivery after shipment. At KoreaBigEyes our mission is to simply provide you the latest more fashionable trends of cosmetic contact lenses to suit your everyday lifestyle and fashion sense. 5 Chances to win per person with 3 mandatory entries and 2 extra bonus entries! Please fill the form below to enter! Gonna enter cant wait!!! I really want a pair of circle lenses. Never had them before. If I'm lucky enough to win, I'd like the neo queen aqua. Thanks for the giveaway Eki. hey there. Did not have space for leaving EMail in the form. Hi eki!! Thanks so much for this giveaway! But I can't seem to go onto koreabigeyes.com's website :( I'm not sure what other lenses they have soo I just take my pick based on the lenses that most stores have, is that okay? My email is angeladearr @ gmail.com; and I would like the EOS Candy Brown! I love that! I really enjoy this giveaway! Hope I'll win of course! Very nice of you to do this giveaway for your viewers! Fantastic giveaway! They have some lovely choices on their site. Thanks for giveaway eki! ♥ I hope I can win! Love koreabigeyes. joined!! thanks for the awesome give away Eki! I love contests (: I never seem to win but that doesn't matter it feels fun! Love the lens Collection they have! Thank-you for the giveaway! Thank you for the giveaway but it looks like some of us can't like the facebook page. It says "This page can't be seen by the current user."... I googled the problem and it looks like the owner of the page may have a country restriction or something and he/she has to change the setting. I can't see the form. information in here is stunning, like you practically wrote the book on the subject. Great stuff; please keep it up! Just entered my entry... Hope lucky star is on my side. I would love to try Princess Eyes Cosmo - Pearl Gray - absolutely stunning lens... Can't wait and so excited. www.kpop2.com KPOP Fashion Lenes shop. You can buy a korean contact lenses $ 10. It is a safe color contact lenses approved by KFDA. Will be free shipping on orders over 50.
some searching and wound up here "Giveaway: KoreaBigeyes.com giving away 5 pairs!". And I do have some questions for you if it's allright. Could it be only me or does it look like some of these responses look as if they are left by brain dead individuals? :-P And, if you are posting on other sites, I'd like to follow anything fresh you have to post. Could you make a list of all of all your communal sites like your twitter feed, Facebook page or linkedin profile? My website - How To Find out if You Have " moobs "
Look into my blog post :: Will be gynecomastiasurgical treatment safe to your health?